“Set Naps” describes when you have your child’s nap time be at the same time every day no matter what time the child woke in the morning or woke from the last nap. I have often been asked about set naps over the years. I am a bit leery of the idea of telling you what age to do them. I think having the idea of “set naps” in your mind can set you up for failing to recognize when the child needs more sleep for some reason, needs nap time moved back, or needs you for some reason. When your body sleeps at the same times every day, it gets tired at those times. It is definitely preferable to be pretty consistent from day to day. Some moms do find that set naps can fix chronic short nappers. I think a big reason for this is just training the body to be tired at certain times and awake at certain times. At the very least, it makes your life a little easier and a little less concerned about what time nap needs to start. The analyzing is put behind you. A great thing about the time when baby comes to be more consistent is it is easier for you to plan your days around baby’s naps. I find babies are typically ready for “set naps” around 6-7 months old. 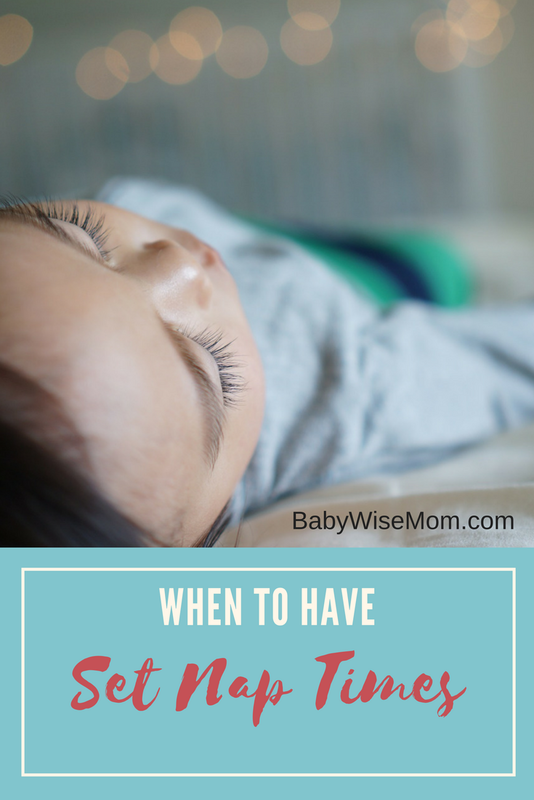 You will want your child taking 2-3 naps and on a consistent feeding schedule (usually the four hour schedule is happening when baby is ready for this). Now, I don’t want you to have your baby reach 6 months old and you decide naps are at 10 and 2 and never stray from it until baby grows into a toddler and drops to one nap. I would prefer you think of “set naps” as naps start at the optimal time for baby until it needs to change. If you follow my baby summaries, you will see that waketime length slowly increases over time. So if you decided that baby will be up for 1.5 hours in the morning and just stick with that, you will miss as baby needs to be up for 1 hour 40 minutes, then 1 hour 45 minutes, etc. So nap time can be set UNTIL it needs to change. Nap time can be set until it needs to change. And it will need to change. And it will need to change often. There will come a point when your child reaches a pretty consistent nap schedule…until you get into the pre-dropping phase. Nap times with range from child to child. By the time your child is old enough and consistent enough for “set naps,” she is likely up for 1.5-2 hours at a time before the nap starts. If your child does not have a third nap, it can be longer–usually 2.5-4 hours. You will have to go through the steps of figuring out optimal waketime length. You need to be watchful of the set nap and not just slip into a state of complacency and miss signs that things need to change. Watch for signs that your child needs her “set nap” time moved back. The biggest sign for this is that your baby will play in the crib for a long time before falling asleep. Watch for signs that your child needs her nap time length to be longer. This often follows the dropping of the third nap. It can also come because of a sleep disruption earlier in the day or week, because of sickness, or because of a growth spurt. Allow extra sleep when your child needs it. Don’t freak out when your child veers from this “set nap.” Again, sleep disruptions, sickness, or growth spurts can mean your child needs to go down for a nap earlier than usual. I find that when my baby needs to go down for a nap earlier than normal, she still sleeps until her normal wake up time. If I try to keep her up until the time she is “supposed” to nap, she often won’t sleep as well because she is overly tired by that point. There might be times your baby wakes early for various reasons. Again, make adjustments. Sometimes, you might still start the next naptime and the normal “set naptime.” But you also might need to start the next nap earlier than usual. As your baby gets older, your “set naps” will get more set. A 19 month old (who is down to one nap) is a lot more consistent day to day and week to week than the 9 month old. Let me know if you have questions about set naps. For me, it was never a day I woke up and said, “From this day forward, naps will be at the same time each day!” It was more of a realization that the baby was so consistent and the schedule was so in place that we pretty much were on a set nap routine. I'm SO glad this came today! I have a 13 month old boy, who we have always had a little trouble with consistent nap lengths. I try to stay as close to 10am and 230 as possible (His naps are typically 1.5 hrs. in length if they are good.) If they aren't, I have been focusing on 3 hr. wake time, so then his naps are not at those set times. Sometimes this works and sometimes it doesn't. I wonder, at this age, if this is part of the problem. Do you think at this point that I can stick to those times regardless of how well he slept? Today, for instance, we had a 30 min. morning nap. This happens sometimes the day after a routine like Sunday, where a morning nap is missed for church. So, he slept 30 min… and I'm never sure if I should put him down earlier than 3 hrs., or put him down at 230, which would be 3.5 hrs. of wake time. I didn't have these issues with my 1st, as he was pretty stable by 7 mos. Really looking forward to your thoughts. He sleeps from 8-7 pretty consistently. Thanks!! I have read most your posts about naps and optimal waketime and I am curious what length of time constitutes "taking a long time to fall asleep for a nap"? My almost 11 month old has been on two naps since 9 months and just recently has started to take up to 20 minutes to fall asleep (max 30 minutes). Is that too long? Should I keep her up an extra 10 minutes? Thanks so much! Your blog has been a lifesaver. I'm glad to see that "set naps" can be a good thing. I have to pick my oldest up from school at 11:30 so my younger son can't nap until we get home, regardless of how his morning nap went. I was worried that I wasn't able to be flexible for him but it ended up working out just fine. I'm happy to report that my 11-month-old is finally on a set nap schedule!!! Your blog has been a priceless resource to me these past 11 months. As a first time mom, I was totally lost in a sea of parenting styles and Brooke has never been an easy sleeper. Thank you for sharing your experience! I just started reading your blog! Thank u for the great tips. My baby is 6 1/2 months old & nurses to sleep. He doesn't want food unless he is going to sleep. He wakes up at 8 am the naps at 10 & 2 & wants to nurse to sleep. I try to feed him when he wakes up & he just bites. He is up in the middle of the night at 12 or 1am & 4-5am. He only nurses 3 times in the day! ugh! We have started solids 3 weeks ago but spits out everything. We've tried rice cereal, bananas, sweet potato, avocado, pears, & applesauce. He doesn't eat well or sleep well. I know he needs more food. He doesn't take a bottle either. I want him to be a babywise baby. How do I change this? I always read and heard about set naps working for people but it never worked for us. When we tried set naps the nap habits got worse and worse until there was no nap at all. We tried it two different ways. One was specific times, the other was within a range of 30min (for example between 9 and 9:30)depending on tiredness and wake time.For our particular baby it worked better to do naps by awake times until he was about 18mos old. Now we do nap within a range of 30min. Sarah,At that age, for the most part I would keep it consistent. However, if he gets overly tired, he won't nap well. So if a nap doesn't go well, I would plan on the next nap starting at the normal time or up to 30 minutes early. So if it is normally 2:30, start watching at 2 to see if he needs to go down early at all. Emily, it depends on the child. The baby whisperer (Hogg) says that 20 minutes is normal. I haven't ever had a child who took that long, however, and if my children take more than 10 minutes, I think something is off. Since that has been true for all four children, my inclination is to stick with longer than 10 minutes. Hogg does say 20, though, so you probably have to figure it out for your indvidual child. I would say anything over 20 is likely universally too long. Bekah,Start with this:http://www.babywisemom.com/2013/02/starting-babywise-late-guide.htmlFeed him when he gets up in the morning, then don't feed him before his nap. If he isn't fed before his nap, he will be hungry when he wakes up. Good luck! Thanks for sharing that Holly! Valerie,Thank you for your blog! It's been so helpful! I am a first time Mom to a 6.5 month old boy. I work Tues/Thurs and my Mom keeps him on those days. As a result, a schedule has been difficult because my mom is not a scheduled person 🙂 He sleeps great at night – 7pm-6:30/7am. His naps, however are all over the place. He will consistently take a good morning nap (usually around 8am/8:15am – 10/10:30am) however he can't do it in the crib. He sleeps AMAZINGLY in the nap nanny we have – I put it in the bathroom with the fan on and light off. I don't know if it's the darkness of the room that helps or the elevated nap nanny? Like I said he sleeps great at night in his crib but will only sleep for 20-30 min at a time in the crib for naps and he cries for 15-20 min first. I've tried letting him CIO mid-nap and he just either cries and cries or just lays there and plays with his feet but won't go back to sleep. He's getting too big for the nap nanny (we started using it due to reflux as a newborn) and obviously i want him to be able to nap in his crib but he gets so over tired if i keep forcing it. Any suggestions?? Thank you so much!! Hi, I also love this blog! I am struggling with naps.She is 12 weeks, we are trying to be on a 3 hr schedule. We wake at 7am,10, 1 etc. the problem is length of nap. She wakes after 45-60 min. Should I let her CIO? It sometimes works for the first 2 naps but almost always by the 1 or 4 pm after crying we end up starting the next sleep way earlier and cannot get back on schedule. She does however, go down between 7-7:30 and we wake her between 9-10 for a dream feed and she sleeps until 5:15-6:15 (we are trying to lessen the amount of milk at 5:15 to ween her of that feeding, I am confident we can do that), we put her back down until 7am. What should I try adjusting? I don't want to disrupt the night because she sleeps so well. I just don't know how to manage the schedule. Thanks! Has she always slept that length or did it used to be longer? Does she go to sleep initially on her own?